Picture the scene – you’re on holiday, drifting along the hotel pool, eyes closed, your body cushioned by your quirky pool float. The sun’s glowing, rays wash over your body filling you with warmth from top to toe, and with each deep breath your worries slowly fade into the distance – sound like paradise? It’s a fact you can’t beat a good inflatable, a must-have for your beach holiday. The perfect travel accessory for the young (and young at heart) – inflatables are a great way to relax, have fun and unwind in the pool or in the sea. But what’s on trend for 2018? Will last year’s pink flamingos and unicorns still make the cut or will newcomers float to the top? Take a look at our top 10 best inflatables! 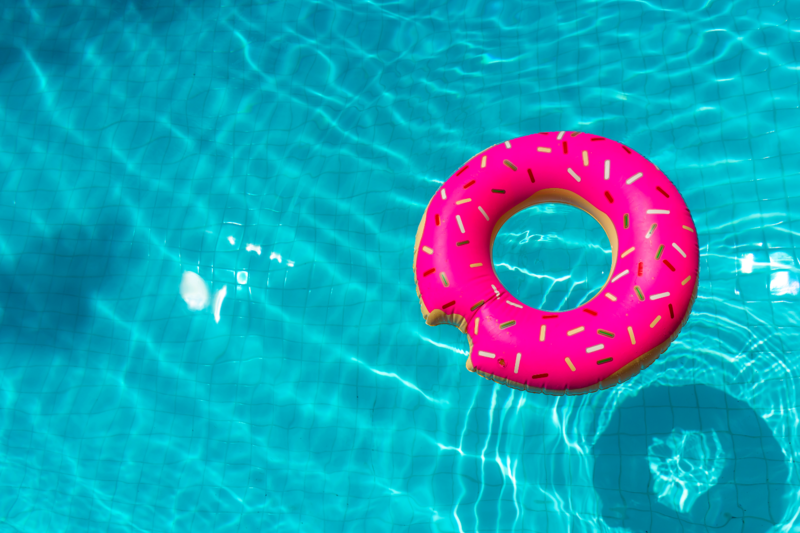 For those with a sweet tooth looking for a comfy shape, choose a doughnut to relax in the pool, beach or lake. The bonus is it’s pretty easy to inflate and deflate – not to mention they make for a great Instagram photo! Available in pink or brown, it’s a simple design perfect for those looking for something not too elaborate. Click here to purchase your super-stylish doughnut and get ready to make other holidaymakers green with envy. This one is perfect for the kids! Your little ones are sure to be impressed with the ride-on alligator inflatable, accessorised with grab handles for extra safety. Who said it was just for kids? This fun-filled pool float will have you and the whole family in giggles – we sense there’ll never be a dull moment in sight. Grab yours now! Popular in 2017 and making a return for 2018, who can resist the inflatable flamingo? It’s a top seller when it comes to inflatables and that comes as no surprise, this large pool float is the perfect tan-topping companion, big enough to fully sprawl out and enjoy the hot holiday sun. A huge hit with holidaymakers, grab yours here before its too late! A new, but popular inflatable choice for 2018 is the floating pretzel made for three – meaning you and the family can enjoy this firm favourite together. Alternatively, sprawl out, grab a cocktail and make the most of it yourself, you won’t be disappointed! Without a doubt, the swan has to be the classiest inflatable on the water – possibly the most versatile of all inflatables too! Great for riding, playing or just swanning around, you’re sure to have a blast. This pool float was definitely a firm favourite in 2017 and seems to be keeping its winning title for 2018, you’re bound to be the most stylish one abroad. Feeling fruity? This funky half-slice of watermelon has all the kitsch appeal you’ll ever need for a beach inflatable! The perfect size and shape to lie back, stretch out and let your worries wash away. It doesn’t count as one of your five-a-day, but it does come with relaxation guaranteed! Get yours here. Let’s continue the fruity theme and relax on this ginormous floating pineapple! It’s one of the larger inflatables this year, but all that extra space means more room to chill. Did we mention it comes with three floatable cup holders? Keep the All Inclusive drinks flowing. This one certainly has the wow factor! Look pretty in pink with this glittering seashell pool float, big enough for you and your friends – it’s most definitely an inflatable for a getaway with the girls. Accessorised with two cup holders, this comfy float has it all, you’ll never want to leave the water! If comfort is your number-one priority, then the inflatable air lounger is hard to beat. Made for water or land, the choice is yours – either way you’ll have the ultimate relaxation right at your fingertips. No more fighting for a sun lounger too, plonk this poolside, get comfy and let the tanning commence! Last year’s mythical Instagram favourite returns, remaining as popular as ever the unicorn float is number one in the inflatable world! We especially love that you can double up on this one, with it being suitable for two riders – you and your bestie can jump onboard. Double trouble and double fun in the sun, you’re onto a winner! Whichever inflatable you pick for 2018, it will be one of the highlights of your pool and beach adventures!